Polaris solar PV net news: global PV industry again the new round seating order shuffle. This time, a headquarters in Shanghai of the Chinese PV industry team to the pinnacle of the industry. “Silicon components Super League” (SMSL) Member jinko recently issued second-quarter report showed that the solar module shipments in the second quarter in a row ahead of SMSL competition Trina, who sat under the squeeze of a world champion for two years, won the total shipments of the world’s first. , Including Suntech and Yingli, Trina, apt will become the fourth to win global modules-Chinese enterprises. After a series of crisis under the photovoltaic panel manufacturer in China, strong growth this year, the profits are substantial. Originated in Suzhou solar Sun power, first launched privatization back ja solar, last year restructured GCL integration successfully broke into the top ten for the first time, as well as two former champions Suntech and Yingli Green energy, leapfrogging the competition, entering the ranks of the first members of the Club of the world’s top ten, built a famous “wall of Defense”. Carry the lead banner on jinko, previously in the PV industry has always been a follower. New champ jinko’s founder and Chairman had Xian de was born in Zhejiang yuhuan, just this year, the age. Founded ten years ago to the old revolutionary base areas in Shangrao in Jiangxi province in the Mainland ATP energy, the industry was not optimistic about. Xian de has repeatedly told reporters after a word–jinkosolar “follow the sun shine” way. Since 2014, has been to create “strong year” jinko momentum of components shipped in 2016, second-quarter shipments rose to 1716MW, setting a new quarterly shipment record, beating its previous historical peak in 2015, the fourth quarter hit a record of 1709.9MW. Crystal section energy of competition opponents, and global PV industry, Chairman of, and days collection light Chairman and CEO Gao jifan led of days collection light, earlier shipping volume for 1658.3MW; Shang annual first among second, by “thousand people plans” experts, and in China PV industry has “PV scholar” of said, and solar Chairman and CEO Qu Xiaohua control of solar, the again return third of location, its earlier PV component shipping volume for 1290MW. Another big star, revamped last year first year into the top ten, nearly a decade the photovoltaic industry’s largest black Concord integrated performance is still good. Half-yearly report shows that the company’s half-yearly revenues of 6.71 billion yuan, an increase of 88.04%. However, its ownership in listed company net profit of 193 million Yuan, an increase of only 2.77%. In 2015, the previously unknown GCL integration, and “Airborne” to the world’s seventh location. In addition to outside the polysilicon large harvest, the world’s largest silicon longi leading company shares benefited from the digestion of the da Tong leader in Al-Qaida, which vested in the shareholders of listed companies more than 830 million yuan in net profit, an increase of 630%, becomes a six-month profit of PV industry in China one of the largest enterprises. The announcement of the tally of the world’s top three companies, for the first quarter of robust demand from the United States and China, accounts for the majority of shipments, Southeast Asia and India, the rise of South America has become a booster. Different from embarrassment years ago Delta does not increase profits this year shipped “quantity” on the increase, but also the great China, regiments of “quality” improvement-financial performance made a big jump. Jinko’s second-quarter revenues were $ 896.1 million, an increase of 86.1%. Gross profit was $ 182.4 million, gross margin was 20.4%. Trina’s gross profit of $ 176.3 million, gross margin was 18.3%, compared with 20% a little decline in the second quarter of 2015. Gross profit rose in part because the company’s Thailand factory to the United States rise in shipments to avoid anti-dumping tariffs and, in addition, also thanks to its downstream operations. Solar net revenue of $ 805.9 million, gross margin was 17.2%, slightly higher than the first quarter of the year 15.6%. Major PV family rising gross margins due to the component of the giant manufacturing cost decreases. GAO jifan assessment to reporters, said Trina’s financial and operational indicators all improved component shipments before the major policy adjustment of China’s subsidy boost demands continue to rise. GAO jifan said earlier in an interview, beginning in the first quarter of this year, has foreshadowed a good start for the whole year, unit shipments year on year increase, key is from the United States, China and India are three key market demand. Seems to be forming a tacit understanding between the Giants. These intensive companies in nearly a month of earnings conference call, in response to the reality that in the second half of “630″ PV project goals or face cut after the new deal. The company’s management stated that, compared to the first half of China’s market demand will decline. China’s excess capacity and a decline in average selling prices will be facing a problem in China. Jinko CEO told reporters Chen Kangping, component shipments reached a record high, exceeding the expected target of the highest value, despite industry headwinds and the late, but he expects global demand to remain strong. Chen Kangping said he believed apt in the second half of the year will be able to benefit from the strong growth momentum. Reporters found that with other Chinese competitors two or three lines of the most different PV modules in the first Club bosses earlier market internationalization, can offset the risk of orders in the domestic market. In solar, for example, in its shipments in the customer’s territory, second quarter of 2016, United States sales accounted for net income of 47.6%, Asia accounted for 39.5%, 12.9% and other parts of Europe. United States and Asia were higher than the first quarter of 2016, has increased. In addition to simple shipping, sinking into the operation at the lower end of solar PV power plant and related portfolio also becomes each big PV’s important tasks. Notice shows that solar 2016 revenue goal from $ 2.9 billion to 3.1 billion had been raised between 3 billion to 3.2 billion dollars. Solar source told interface for journalists, which means sell more PV solar will be the second half of this year. Qu Xiaohua has said, the future of the company will continue to use the project to preserve and project sales strategy to ensure operational flexibility to maximize cash flow and balance. According to solar these sources, currently operating solar power plant, about 438MWp, an estimated resale value of about $ 950 million. 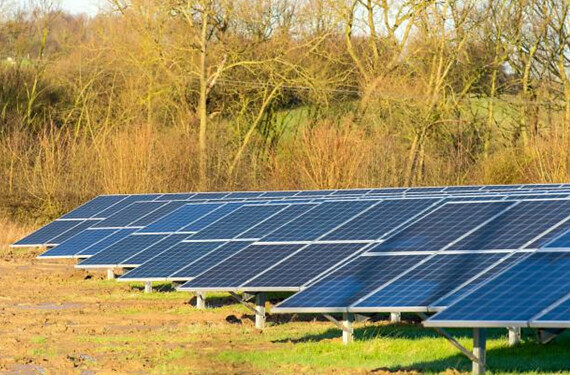 The company is planning to sell some PV power plant assets in the second half of the year. Meanwhile, there will be more solar photovoltaic power plant is put into operation. However, PV projects under construction may not be able to obtain the necessary permit and incorporation for approval, as many PV companies need to face up to the risks. Suntech downwind clean energy group, two years after the acquisition, gradually recovered, brand establishment again, reconstruction and restoration of global supply network. Yingli Green energy-related interface told journalists, Yingli is no longer simply the pursuit of shipments now, getting out of debt has become a priority for Yingli. The source said Yingli restructuring are relevant ministries under the leadership of propulsion, a rebirth of Yingli is fast approaching. Although there is still excess capacity in the industry concerned, but had experienced “life crisis” expansion of PV Giants does not stop on the road. For two consecutive years as the world’s largest PV modules manufacturer Trina, announced its withdrawal from the MIP (minimum import price agreement), and in 2016, the first official after confirmation by the European Commission, began to pick up in South-East Asia and India distribution. Curves overseas workshop for Europe on the one hand, to avoid “double reverse”, and also caught the rapid development of India and other country’s local market. Solar uses the chain up and down each other share cooperation, has a stake in Suzhou Crystal silver paste, and GCL silicon wafer production workshop, now in Luoyang started the solar wafer, cell, component, 1GW of the whole industrial chain construction projects. Overseas, in Canada, and Viet Nam, Indonesia, and Brazil, and Southeast Asia amounted to 1500MW capacity layout. Solar also said Southeast Asia to build a 400MW photovoltaic cells production line is expected in 2016 and put into production in the second half. People in the industry said, according to the Chinese PV industry the expansion projected at hand, Chinese companies may emerge sporadically global hegemon seats will remain for a long time, Korea Korean Chinese, and United States top ten established international giants such as first solar will face more megawatt Chinese rivals. Polaris solar PV net news: many green industries are medium-and long-term projects, such as sewage, solid waste, energy, subway, railway, the repayment period of the project is ten or even 20 years. Many countries rely on the banking system to finance green projects, but the banking system will be restricted by the maturity mismatch. Due to the lack of definition of green financial products, investors do not know what green projects and green assets, even if it wants to invest in this area, it is difficult to identify investment targets. A case study of green credits, only three countries in the world have a clear definition. 27th June Ma, Chief Economist for the Bureau of people’s Bank of China research by the Chinese finance 40 Forum and its northern new finance Institute jointly organized the first “green Finance Forum in Tianjin”, said many countries around the world will require massive investment in green, to address environmental and climate challenges, but fall far short of the demand for investment in green investment. He summed up the global green five challenges for financial development, and considered measures to cope with challenges from four aspects. Ma said that as Chair of the 2016 G20 countries, China will green the financial G20 issues, and promote the establishment of green finance research group, research on how to promote green finance for development according to its own characteristics, improve the greening of global financial institutions and capital market to the green industry’s ability to allocate resources. In July 2016, green finance team to Chengdu G20 Finance Ministers and Central Bank Governors of the G20 green comprehensive financial report was submitted. In this process, green finance team did a series of works. First of all, why promote green finance in the world. As in China, many countries around the world will require massive investment in green, to address environmental and climate challenges. Actually happened so far fall far short of the demand for investment in green investment. From the Green credits in terms of size, there are only three countries have a formal green credit statistics, China is one of them, the other two are Brazil and Bangladesh. Green credit in the proportion of China’s total loan balance is 10%, Brazil is 10%, Bangladesh is 5%; from the green scale in the bond market, the current “labeling” green bonds of less than 1% of total global bond. The size of the assets from the Green, while the current global statistics are not complete institutional investors how much assets into low-carbon green, but in some statistics from countries, such as Australia, only 2%-3% of the assets are held by institutional investors of “low carbon”. Green finance has tremendous potential for development. It is imperative that figuring out what Green challenge for the financial development is, and propose measures to meet the challenge. Ma believes that green finance faces five major challenges. A green project internalization of the externality problem. To cite an example, a clean energy project’s effect is to reduce air pollution, within 300 kilometers of residents can benefit. But the residents do not have to pay for this project to benefit, so the positive externalities of this project have not been completely endogenous, making the project rate of return is not very high, probably less than the required rate of return in the private sector. Therefore, the private sector less willing to participate in such positive externalities are not endogenous green projects. The past few decades, countries have used many ways to deal with external issues. Fiscal instruments such as direct subsidies to the project or projects use regulatory means to limit pollution, forcing financial institutions to devote more resources to the green industry. But the last more than 10 years, we found that field there is a lot of financial means available to help the externalities internalization of green investment. Are some green projects can, for example be subsidized to reduce its financing costs, thereby improving yields; guarantee for green projects, reduce their risk premium, thus reducing their financing costs and improve yields; or by means of PPP, higher yielding around project bundling operation with low yields of green projects, improve their overall investor returns. Second, green project maturity mismatches. Green industries are medium-and long-term projects, such as sewage, solid waste, energy, subway, railway, a lot of the repayment period of the project is ten or even 20 years. Rely on the banking system in many countries provide financing for green projects, but the banking system will be restricted by the maturity mismatch. For example, China’s banking system average debt maturity of six months, so its very limited capacity to provide medium-and long-term loans, which hinders its medium-and long-term financing green projects capability, easy or medium green project financing, financing an expensive problem. Many approaches to international development, such as green bonds market. Green bond market last year, China had not, but this year it has become the world’s largest. It was a very important way to resolve the maturity mismatch, and can have long-term projects in both direct the issuance of three-, five-or ten-year bonds, also enable the banks to issue medium-and long-term green of green bonds to support the medium-and long-term loans. There is a method in the United States is more popular, similar to real estate REITs, the proceeds from future Green most of the assets are in the form of dividends paid to shareholders on a regular basis an equity tool, you can also access to medium and long-term financing for green projects. Another approach is the proceeds of future green projects, including energy efficiency contract revenues, gains, emissions and emission of carbon, as collateral and collateral to obtain bank loans or bonds. Third, lack of green definition. Due to the lack of definition of green financial products, investors do not know what green projects and green assets, even if it wants to invest in this area, it is difficult to identify investment targets. A case study of green credits, only three countries in the world have a clear definition. Green bonds aspects, global currently only several defined, a is GreenBondPrinciples, II is CBI of defined, third is China financial learned green financial professional Committee of green bonds support project directory (2015 version), national NDRC recently also developed has a 12 a category of green project directory, but many national of green debt market also no himself of defined, also no clear to used GBP, international standards. In a sense, leading the efforts made in connection with the definition of China, but have not done enough in this regard. Efforts in this respect has only just begun. Four is the asymmetry of information. Some investors want to find obvious environmental benefits of green investing, but lack of judgment of the related enterprise and project level, because these companies tend not to disclose, such as carbon dioxide, sulfur dioxide, sewage discharge and energy consumption information. If you have quantitative data, capital markets will be able to identify which project or enterprise is dark green, which are light green, which is Brown, which is black. Only the disclosure of these data, capital markets for these companies can use a variety of methods of environmental benefit assessment, sorting or green. So, must strengthen the disclosure of environmental information to meet the challenge of asymmetric information. So far the world over more than 20 stock exchanges issued guidance on environmental information disclosure of listed companies, but mandatory disclosure of stock exchange is not. Five is the lack of environmental risk analysis capacity. For example, some financial institutions have underestimated the investment in polluting industries to pose a risk. Such as steel, cement, chemicals, glass and other industries that, since there is no estimated rate may exceed expectations in the coming years, which caused some financial institutions to provide loans to polluting industries too much. In addition, since there is no estimate on the Paris agreement required by global carbon reduction target will result in the value of oil companies have oil reserves will fall dramatically, some institutional investors may be overly invested in oil companies, a high carbon intensity of enterprises. For example, some institutional investors and banks have not fully estimate the potential long-term benefits of investment in green industries, but overestimate these risks to the project, so the Green there is excessive risk aversion, not willing to invest. Faced with these problems, it is necessary to strengthen research and promotion of environmental risk analysis methods. Ma introduced the Green finance team proposed specific measures to address these challenges. First, it provides a policy signal. Research Group’s response is called for policies to support green investment signals provided by States. The world’s two largest green investment signals is SDG (sustainable development) and the Paris agreement. These are the States a principled commitment to sustainable development and climate change. However, these principled commitment should be translated into country-specific programmes of action in the future. If major countries to release five years, ten years or 15 years implementation of the action programme of the Paris agreement, green investment will play a significant role in boosting confidence. China can be considered the first to do this thing. Second, the principle of promoting green finance. First of all, the Equator Principles. The main contents of the Equator principles are guiding the banking industry how to manage environmental risk in project financing. In addition there is also a United Nations principles for responsible investment, an important element of which is institutional investors in the investment decision must take into account the environmental impacts arising from their investment, to evaluate its investment environment is conducive to environmental protection or increase the pressure. Meanwhile, institutional investors as shareholders of listed companies, has a responsibility to require the invested enterprises to fulfill their corporate social responsibility, the economic activity of the enterprise must take into account the impact on the environment. Third, the development of green of local currency bond markets. Green bond market maturity mismatch problem can be solved. Internationally there are one in the OECD countries and some developing countries through open green market, the majority of the market participants follow GreenBondPrinciples. Capital projects in these countries are basically open, easy financing in the same market. But there are also many emerging-market countries, capital projects are not completely open, and some national environmental policy priorities with OECD countries are not the same, definition of green bonds need to be localized. These countries need to develop their own green of local currency bond markets. Now, India, and Indonesia, some Latin America and other countries and regions are planning to develop their own green of local currency bond markets. Finally, to strengthen capacity-building. Many green jobs in the financial sector requires financial institutions to have strong environmental risk analysis and management capacity, as well as the ability to develop new products. Some countries in these areas is quite strong, and there are a lot of countries relatively late, so international experience sharing and enhanced capacity-building for global green finance will play an important role in promoting development. IFC operates a sustainable Bank network (SBN), have been trained in the past few years more than more than 20 State banking regulators and Banking Association, helped them to form the country’s green credit principles, it is very important for green credit capacity-building. Green finance team believe can continue to expand the role and influence of SBN, to cover more countries, more financial institutions. Polaris solar PV net news: 2016 is undoubtedly the photovoltaic industry in the first half of “good year”, under the influence of photovoltaic electricity price adjustment policy, photovoltaic industry, “630 installing surge”, result in January-June this year the domestic photovoltaic power installed more than 20GW, added size over the same period last year (new 7.7GW) 3 times, exceeded all expectations. Photovoltaic companies continue to hand over the first half of the transcript, the published reports, including enterprises, middle and lower reaches of the strong performance of the industry chain. Jinko energy, longi shares, rising in the East as the representative of the solar upstarts are challenging traditional giant, people laugh, and beautiful behind what are the potential risks? Selected PV market within and outside the main operation data inventory, you may wish to look at. Jinko-half net profit of 590 million Yuan, an increase of nearly 4 times, to 3.3GW in the first half of the shipments beyond the Trina solar to become China’s largest supplier of components, prior to this, Trina had won two years in a row, but revenue God still leading. In the report, apt to adjust its shipments for the year 6.5GW Trina reiterated its 2016 annual shipment goal of 6.3-6.55GW, who will be the annual shipments of the Championship, we’ll see. Listing on the gem of the East Sunrise, two consecutive years of high growth in revenues, profits, company achieved operating income of 3.194 billion yuan in the first half, an increase of 97.72%, belonging to the shareholders of listed companies ‘ net profits of 480 million Yuan, an increase of 365.72%. Big revenue although few some gaps, but 480 million yuan in net profit higher than ja, and solar and Trina. The forefront in many Crystal war camp longi shares and jinko have achieved high growth, which the Lungi shares made a net profit of 860 million Yuan, an increase of more than 6 times, top a-share PV companies topped the longi its leye photovoltaic components shipped in the first half 923MW. In the field of single crystal, except longi shares, eging first-half net profit of 280 million Yuan, an increase of more than 7 times, Central shares made a net profit of 250 million yuan during the period, an increase of 168.68%. Overall performance higher than the industry average. PV module shipments of the world’s first ring once upon a head of Yingli, after the loss of 5 consecutive years, ushered in its first profit, shipments in the first half of 1.2GW, achieving revenues of 4.9 billion yuan, a net profit of 150 million Yuan, Yingli to profit, mainly due to domestic PV installing leads to increased demand in the first half. Under the situation of market are not optimistic in the second half, Yingli’s earnings can be sustained? Ying Li said in a statement, PV module shipments in the second quarter of 662MW, shipments may be cut in half in the third quarter. As of the first half of this year, Yingli’s debt to asset ratio was still as high as 127%. Debt problems ease, but still there. Few enterprises in the first half, and technology ranked first, a loss of 50 million yuan in the first half. As the domestic photovoltaic power stations “build-transfer” model of pioneer, developed technology PV power station has been in the private enterprises took advantage of the total. 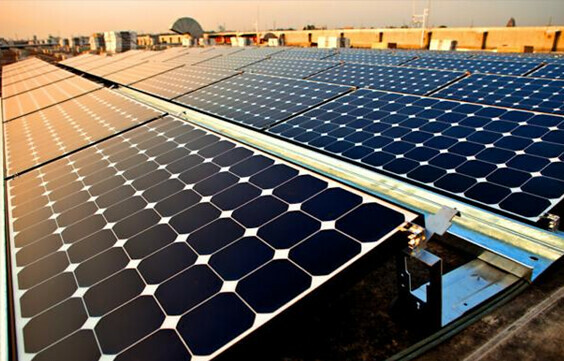 Photovoltaic technology in the plate has become the most catch the eye of the capital markets business. In earnings, the company said, under the influence of Li Tenghui 130MW photovoltaic power plant fails to transfer in, half results failed to achieve profitability. Past, the developed technology PV power station in seasonal features, mainly in the first three quarters project, approval, construction, and was not until the second half of the revenue and profit recognition. So the company net profit in the first three quarters of losses until four-quarter focus on revenue recognition and profit losses after profit. In 2015, for example, the company in 2015 52.67 million Yuan loss in the first quarter, a loss of 153 million yuan in the second quarter, a loss of 85.6 million yuan in the third quarter, four-quarter earnings exceeding 700 million Yuan. In this respect, technology in four quarterly losses would be the probability of the event. Investments to stimulate the capacity utilization ratio improved in 2016, about the first half of 27GW,50 companies that have an average capacity utilization rate of 83.5%, industry profitability significantly. However, better days may be gone in the first half, PV installed capacity in the third quarter are expected to fall in the industry 80%. The price war has begun in the second half first representatives of poly-crystalline energy and Crystal Enterprise took turns making the minimum price, and leader in the base bid, GCL 0.61 Yuan price new energy news, shocked the industry. Insiders believe that costs supported by falling electricity prices is a good thing, of course, but must have a system cost support, irrational bidding would have an administration misjudged? Subsidy arrears routine, minimum protection for power generation in some areas are problematic cases prematurely to promote parity, the Outlook is not optimistic. Crazy installing led the new wave of the expansion raised concerns of excess capacity, and early access to “exhausted” mode, unlike in the past, this wave of expansion mainly led by the industry leader, since the second half of 2015, Trina, Crystal, solar PV, led by manufacturing companies began to set off a new round of expansion wave. In 2016, the first half of the excess capacity of which obscured by the popular market, further stimulating the manufacturing capacity expansion intentions. Along with the drop in demand, market competition will become increasingly fierce, at the arrival of the new round of excess capacity, who can live on that in the future depends on the level of cost control. PV industry transition is taking place, to ATP energy, longi shares, rising in the East as the representative of the new power of PV you can do so on the throne? Polaris solar PV net news: 29th, Xinjiang issued to monitor the ban in late 2016 work plan lists comprehensive, market regulation, industry regulatory offices work plan and special supervision programmes in the second half. Among them, the industry regulator in late 2016 will focus on decentralization of the follow-up supervision, new energy, eliminate regulatory regulatory follow-up management, illegal mining, energy saving and emission reduction work four jobs. Main monitor in Xinjiang all photovoltaic power plant and electric power dispatching Center abandoned statistical processes and data, identify problems, calculating PV power station in Xinjiang region to abandon proposed management approach. 2016 2, drafted by the selection and the drafting of the preliminary work done. 2016 3, seminar of regional power plant, has finished the first draft for comments. 2016 4 formally issued a complete consultation and modification work, strive to complete PV in December to abandon optical calculation management of published work. Polaris solar PV net news: according to the Jiangsu provincial development and Reform Commission on 2016-PV “leader” planning optimization work notice (sangda modified energy (2016), No. 818) and related requirements, received a total of declared items 79, total size of 3.08 million-kilowatt. Jiangsu regulatory National Energy Board Office and the stationing of discipline inspection group under the supervision of provincial Commission for discipline inspection, I appointed organization sector specialists and industry experts, in accordance with the qualitative and quantitative methods, photovoltaic “leader” preferred the plan to declare the project review. To the basis of expert comments, combined with the relevant departments to written review comments, proposed Huai an Jin Chen Qiao 100MW Yue Kwong mutual complement photovoltaic power generation project (50MW) and other 8 projects into the 2016-PV “leader” scheme is public. Publication period: August 30, 2016-September 5. If there are objections, reflect their views to the Advisory. December 29: according to Taiwan media news reports DigiTimes, Apple has been working on assessing all iOS devices (not including the Apple TV) equipped with IGZO display feasibility, if all goes well, we will be in 2013, iPad, iPad mini, see IGZO iPhone screen. IGZO (Indium Gallium zinc oxide) as abbreviation of Indium Gallium zinc oxide, amorphous IGZO material is used in the new generation of thin-film transistor technology channel layer materials. IGZO materials from Japan Tokyo fine yexiuxiong University of technology was first put forward in the TFT industry applications, at present the materials and technical patents mainly by Japan manufacturers have, IGZO-TFT technology first in Japan sharp volume production. TFT (Thin Film Transistor) is a thin-film field-effect transistors, TFT LCD screen means that each liquid crystal pixel on the LCD Panel is integrated in the thin-film transistor-driven, which is used in mobile phones often heard on “TFT screen.” Common main TFT-driven classification of a-Si TFT (amorphous silicon), LTPS TFT (low temperature poly silicon), IGZO TFT also fall into this category. So end, sharp this by proposed of IGZO Panel, still is a TFT LCD screen, actually IGZO TFT technology also can using in OLED Panel Shang using IGZO technology can makes display power close OLED, but cost more low, thickness also only than OLED only high out 25%, and resolution can reached full HD (full HD) and Super HD (Ultra Definition, resolution 4k*2k) level degree. Polaris solar PV net news: was informed that at the just-concluded “2016 in Qinghai, China renewable energy industry development forum”, National Bureau of energy sources, solar thermal power generation demonstration project list may be issued in one or two weeks. These people said, the energy is primarily price Division in conjunction with the national development and Reform Commission, introduce pricing policies, policies came out, will soon be issued. According to the report’s preliminary evaluation of the demonstration projects on solar thermal power and control in Qinghai four project in the project list. September 23, 2015 National Energy Board issued the notice on the Organization construction of solar thermal power generation demonstration project (national new energy (2015), No. 355) by November demonstration project completion of assessment, it has been almost a year. Liang Zhipeng, Deputy Director of the National Energy Board new Energy Division said at a solar thermal demonstration project starting, wish that these demonstration projects September 30, 2016 can be built by 2017, would like to see some demonstration projects put into operation by the end. Previously reported, according to selected from the 109 reporting project preliminary list of demonstration projects (for a total of about 20 projects) of the declared price calculation, the National Energy Board’s recommendations to the price Department of the NDRC price Department pricing at around 1.22, and in consultation with the price, this price does not receive a one-time payment of the price level of identity. This is a demonstration project list and price did not quickly landed the main reason. Previously, control approved by the NDRC’s price Department Delhi 10 megawatts of solar thermal power generation demonstration project at 1.2 Yuan/kWh. In addition, the reporter was informed at the meeting, the “Thirteen-Five” period, Qinghai province, will focus on building in Hainan, two hercynian qianwanqianwa clean energy base, new energy installed capacity up to 35 million-kilowatt. Dengar Hainan Prefecture, Qinghai province, Deputy Secretary-General said in a statement, according to Hainan Prefecture planning development, future solar photovoltaic project in Hainan Prefecture total installed capacity will reach 2500 MW. This forum is sponsored by the China renewable energy society, Center for international cooperation. Guests present included: China renewable energy society Chairman and a former Counselor of the State Council Shi Dinghuan, Zhou Wei, Vice Governor of Hainan State Li Tingxiang, the United Nations Industrial Development Organization, the International Centre for transfer of technology for solar energy xiwenhua, Vice President of the Beijing solar energy Institute of Wu Dacheng, Director of the German renewable energy Center in Tao Guangyuan, sumec energy holding company General Manager Li Xiaojiang. Polaris solar PV net news: the first pilot area of Yunnan electric power system reform, does not assert its right to adjust transmission and distribution price other than the price, but must be carried out through the establishment of market mechanisms, watch out for specious “market”. Adjustment arising from the proposed local wind power, photovoltaic power price, price Bureau of Yunnan province, was pushed to the forefront of public opinion. Recently, a copies name for on sought Yunnan wind electric, and PV power price policy views of feedback of file in industry spread, 15 home enterprise on Yunnan province prices Council on “in national can renewable energy subsidies electric price standard not variable of situation Xia, reference Yunnan province hydropower enterprise average set sold price as Yunnan province wind electric, and PV benchmark Internet settlement electric price” of policy views said strongly against, said its disguised price. Yunnan Provincial price Bureau also responded through the media, the adjustment of wind power, photovoltaic power generation enough of policy backing to the settlement price, are consistent with the relevant provisions of the law on renewable energy, also in line with the reform of electric power market, but also reduce the burden of social power necessary. If you cannot adjust, massive abandoned wind up will be hard to avoid. Outcome of the event within a short time that it is hardly. Various people disagree about this, some companies view, some Government, some select muddle and hopes the two sides each other halfway to compromise-do. Someone who asserted that Government is responsive to market requirements, new businesses find it impossible to live energy can choose not to generate electricity. Irresponsible and biased words, fuel only, not to dispute solved any nutrition. Not find out the facts, it is dangerous to jump to conclusions. Requires a return to basics, get, you should first find out the problem is: the price Bureau of Yunnan province, have the right to adjust the new energy price it? Enterprise feedback that renewable electricity price was formulated by the competent departments of the State Council, provincial pricing authorities only on wind power and PV on-grid price regulation right, national pricing policy in place, of national renewable energy price shall not be adjusted. Electricity price in China’s tightly controlled by the State, appears to have been well known, but is very complex. In the context of current reform advancing in the same period, in particular. View file provided with support enterprise voice. Such as the renewable energy law, renewable energy generation project price shall be formulated by the competent departments according to the different types of renewable energy power generation characteristics and different parts of the case, in favour of the promotion of renewable energy and rational principles. The price law requirements, relevant departments of the local people’s Government or the people’s Governments at various levels shall not exceed power range and allowed to develop, adjust prices or not to implement the statutory price. Last December, the national development and Reform Commission on improving land wind solar power on-benchmarking of the pricing policy of the (the change price (2015) No. 3044) wind was specifically given by different Ziyuan District electricity, photovoltaic electricity price standards. But it is not without flaws, watertight. According to the latest central pricing catalog, province province, power transmission and distribution and above State-set prices; electricity market trading mechanisms before the formation of province province failed of integrated power grid regulation and above market price of electricity price and the province and the provincial power grid above failed, market prices for electricity sales price and the overall level is determined by the State. At present, China is at a crucial stage of a new electric power system reform, “ordered open competitive link other than transmission and distribution price” is the top priority. Pilot projects to Yunnan as one of the first comprehensive one of nature can act in this regard. Therefore, asserts the right to adjust the new energy price in Yunnan, not completely valid. Second question is adjusted properly or not? This round of electric power system reform, emphasizing restore power product properties, the market plays a decisive role in the allocation of resources. Change made by the above prices (2015) No. 3044 article also said that encourage competition in the market, such as through public bidding way onshore wind power, photovoltaic power generation new energy sources such as project owners and price. Common key words are “market” adjustment of Yunnan approach fully reflects the “market”? On the surface, “the utilities average set price” had deviated from the traditional plan pricing models, with market pricing factors. However, extends to wind power, solar power, then the market may have changed. Whatever the market, market participants should be active as space. Yunnan scenarios, new energy has no active as possible, but depends entirely on the local average prices of electricity trading. Bind the settlement price of peaches on the trading price of vegetables, it seems absurd? Paradoxical market easy to confuse the public, but cannot afford the history test. As a new energy pricing reference “conventional energy generation”, focus is also disputed. Development price (2015) No. 3044, civilization, onshore wind power, photovoltaic electricity price in the local new benchmark coal price (including desulfurization, denitrification, dust) within part of the settlement by the local provincial power grid; higher parts be subsidized through the national renewable energy development fund. Price Bureau of Yunnan province, “local coal benchmark price” replaced by “hydro average trading price”, is open to question. All in all, wind power, solar power is the energy transformation of important support policy should be selected so as to promote its healthy development, unable to rush the current oversupply of electricity drops medical service. The adjustment plans to be cautious in Yunnan, or elsewhere to follow suit, with plausible “market” hit with new energy, would be a significant loss of energy revolution. Polaris solar PV net news: according to the Japan Economic News reported on August 28, entered Taiwan subsidiary of Hon Hai, sharp began to strengthen overseas operations. In terms of main business of photovoltaic cells, as Japan domestic market demand, sharp began to look into the huge Chinese market. Television business in Europe and sold to overseas enterprises, sharp also negotiate with holder on the repo. Sharp hopes to expand overseas business, including white goods, accelerate reconstruction. Sharp in China has started trial sales of photovoltaic cells for large photovoltaic power stations, take this market survey. PV cells have advantages in power generation efficiency and durability. Hon Hai is also discussed in China to build a sales network. In addition, sharp also decided in Mongolia, the Philippines, and Indonesia 3 construction of large photovoltaic power stations. Sharp’s solar cell business in the 2015 fiscal year (ending March 2016) appeared in the combined earnings of 18.4 billion yen operating loss. Hon Hai investment before sharp had hinted at a split of the business, but in the end decided to keep it and the implementation of reconstruction. On one hand, sharp also plans to step up sales of white goods in the Chinese market. Except through the stores, but also discussed methods for distribution of sales direct to consumers from the factory. Company attaches great importance to sharp’s white goods business, consider using sales, including product marketing ways to control costs. TVs, sharp has been in Europe and the United States respectively sold to Slovakia’s enterprises and China’s Hisense. As the company hope to independent in its television business in Europe and America, so expect sharp since September and brand repurchase issues to discuss. Can achieve buy-back is unclear. Arctic star solar PV network news: Chile President honey snow son-BA Chelay (Michelle Bachelet) in 2013 second degrees elected zhihou, faced Chile economic growth weak, led to governance lackluster, support rate off to 24%, now finally has a items can with national account of achievement, August 2016 Chile for history Shang maximum power supply tender, regeneration due to large can energy suppliers replaced traditional energy supply bid, makes bid electric price ASP more 2015 big drop 40%, Also invested heavily in renewable energy industries, also have eased Chile 2016 economic contraction in the second quarter. Michelle ‧ Bachelay after announcement of the bid results, the bid results, determine Chile is on the right path, which Chile people’s pockets is a good thing, on the environment and economy is also helpful. Chile has become a powerhouse in the international renewable energy companies investing in northern Chile boost energy investment machinery and equipment investment, Chile machinery and equipment investment in the second quarter increase in the same period in 2015 2016 9.7%, up from 1% in the first quarter. Pumping energy-related investment, plus the price is expected to decline, will be expected to contribute to Chile GDP growth potential 2.5%. Michelle-BA Chelay said the bid power generation plan to be put into construction, will bring a lot of investment, involving a total investment of up to us $ 3 billion, with 3,000 new jobs, so the economy will be good news. Retail electricity prices, starting in 2021, Chile household and small business electricity prices are expected to fall 20~25%. Priced reduced 40% will have the potential to slow an investment boom, but betting plans have been considerable, will continue to bring investment funds. In addition, Chile abundant renewable resources, global renewable energy costs are also falling, so even if the price reduction, future profits. Chile has the best solar resources in the world, with 3,000-kilometer-long coastline and rivers, very suitable for the development of renewable energy. The standard case also hit global solar low have price, previously global solar minimum have price for Dubai Yu May of each degrees electric 2.99 cents, about NT 0.95 Yuan, Chile the tender in the, Spain solar developers day package technology (Solarpack Corp.Tecnologica) standard Xia 120MW solar power field power contracts, have price for each degrees electric 2.91 cents, break Dubai of minimum records, about NT 0.92 Yuan. Polaris solar PV net news: solar photovoltaic cells caused by excess manufacturing capacity in China and other equipment prices decline, India obtained the rapid development of solar energy industry. India’s solar industry is in an unprecedented period of rapid development, mainly due to the rapid decline in tariff rates, increasing skills, mainly in China’s global solar photovoltaic panels and other materials supply is excessive. Although India market than the United States, China and Japan, but its pace is fastest in several major markets. India’s solar industry is growing rapidly due to global oversupply of solar photovoltaic equipment. India bridge (BridgetoIndia), said: “recent market report showed China emerging glut of solar phenomena, particularly evident in late 2016, is likely to drive prices a major adjustment in the future. “China’s solar industry (especially secondary enterprises) had to cut prices further, and look to overseas markets. Meanwhile, the market research firm IHS think domestic solar industry demand in the rest of 2016 will sharply decline. The leading information provider also pointed out that 2016 4th quarter solar PV module prices will be lower than the first half of 10%. India bridge (BridgetoIndia) that such prices diving on the India Solar market timing’s perfect, because they expected before 2017 3 months as India suffered the largest solar added capacity of a quarter of the total could be as high as 2 million-kilowatt. By importing materials for capacity-building activities have sharply hit India local manufacturers. To this end, the India Solar Manufacturers Association proposed to the Government impose protective tariffs and anti-dumping duties. Protective tariffs to protect local industries from the effects of surging imports. When overseas importers to below the level of average market prices for the products sold, to which the importing country has the right to levy anti-dumping duties. Clean energy think tank kuwasuda Foundation (Vasudha Foundation) Chief Executive Officer siliniwa &dot; kelixinaxiwami (Srinivas Krishnaswamy) thought that the India local factories could not cope with the sudden growth in demand, so solar panels imported from China are inevitable. This experiment looks very interesting, but the development team is not simple to play, and the roller coaster Builder, Thomas Wagner team also wanted to make money. But experience really worth having, after confirmed that roller-coaster ride on the headband does not fall off the monitor, monitor sensors in extreme gravity working, in addition, the virtual experience doesn’t make you vomit. Polaris solar PV net news: Taipei City to implement the “positive development of renewable energy facilities of public space” policy and called on the new Government’s goal of promoting a nuclear-free homeland, held his first public premises set in the afternoon of August 25 solar photovoltaic power generation equipment using tenders, planning to release 261 public roofs available for devices 5.7MW system. In a bid at a press conference, play in Taipei City Council said it would open all 90 municipal authorities, a total of 261 buildings roof space, for private sector bids, to set up solar power equipment. Equipment after the building is completed, shall be maintained by the firms themselves, the City Government will play “not funded” characters, but you can gain access to vendors selling back gold 10%, also achieving carbon reduction and environmental protection objectives, creation of Government, industry, civil win. Taipei City Council, said Taipei City due to natural factors such as climate, energy is rather limited, but solar is evaluated by experts is still viable in the past mainly focused on environmental protection and energy saving, promote demonstration-oriented. As of July this year, northern city a total of 25 bodies, 81 43 schools set PV systems, set 2,144kW, annual output of around 1.95 million, including NT $ 450 million Yuan. To encourage private inputs, effectiveness and accelerate solar building, the Taipei City Government for business investment for the first time, opened the city’s 90 schools, 261 office buildings, a total of about 190,000 square meters of roof area, for the installation of solar energy systems, is expected to be over device 5,700kW capacity, annual output of 5.2 million, the equivalent of 18,000 home electricity, but also for the 2,700 tonnes of carbon reduction. And municipal in 20 systems charge about US $ 64 million worth of feedback during the operation gold. Bid bidding scheduled the two separately, eligible companies can download the files from August 22 to September 26 and bidding, selling back gold higher bids. Southern District include: Daan, Chiang Kai-shek, and the Wenshan, Lutheran, Nankang, Wanhua; North include: Zhongshan, Neihu, Shilin, Datong, Peitou, Songshan, respectively, will be the third to fourth quarter of this year opening, and completed tender this year. Polaris solar PV net news: on August 23, the National Energy Board on the 2015 national renewable energy development, renewable energy power in the provinces and the proportion of non-hydroelectric renewable power to dissolve, as well as renewable power. This is exploitation and utilization of renewable energy in national energy Board first announced the annual monitoring and evaluation of results. The 2015 national renewable electricity development monitoring and evaluation report published data show that 2015 renewable energy generation limited “Thirteen-Five” during the development of non-renewable water task is very difficult. Environmental public interest litigation settlement abandoned environmental groups plan to wind up light problem. Reports indicate that in 2015, including water and electricity, and when the total amount of renewable power to dissolve 1.3625 trillion-kilowatt, accounted for the proportion of electricity consumption of the whole society at 24.5%. National non-hydro renewable electricity when the absorptive capacity of 277.8 billion-kilowatt, accounting for about 5% of electricity consumption of the whole society. “5% is what? Is the provincial electricity consumption of a medium-developed provinces in China. “The Vice President of the China renewable energy society Meng Xiangan said that after ten years of development, non-renewable water has formed a certain scale, but the task is still daunting. According to published in February this year, the National Energy Board to establish renewable energy goals guide the system’s guidance, 2020 renewable power to dissolve non-water target needed to achieve 9% of the electricity consumption of the whole society, to non-fossil fuel energy structure of the primary energy consumption reached 15% development goal. Comparison guide non-water system the provinces set out in 2020 renewable energy goal and 2015 provincial status can be found in the report, only standard between Ningxia and Qinghai, Shaanxi, Liaoning and Hainan gap in half. In photovoltaic power generation, for example in 2011, when generating capacity of about 700 million-kilowatt, “(share) is almost zero.” By the end of 2015, the report said, PV 43.18 million-kilowatt, when the electricity 39.2 billion-kilowatt, 0.7% of the total generating capacity. Furthermore, by the end of 2015, the national hydropower installed capacity (excluding pumped storage) to 300 million kilowatts, when electricity 1.0985 trillion-kilowatt, 19.6% of the total electricity generation; wind power installed capacity to 129 million kilowatts, when electricity 186.3 billion-kilowatt, 3.3% of the total electricity generation; biomass power generation installed capacity of 10.31 million-kilowatt, when the electricity 52.7 billion-kilowatt, 0.9% of the total generating capacity. National renewable energy total 480 million kW in installed capacity. Guide the system also calls for the establishment of renewable energy development and utilization monitoring and evaluation system requires the provincial energy departments, regularly submit relevant data, the National Energy Board by publishing an annual monitoring and evaluation of results. China has entered the era of excess, present serious abandon wind up light inhibits the development of renewable energy. 2015 up wind power situation is grim, abandoned the country when that wind power 33.9 billion-kilowatt, rose 21.3 billion-kilowatt, one, Gansu abandon, abandoned when the wind power 8.2 billion-kilowatt wind 39%, Xinjiang to abandon, abandoned when the wind power 7 billion-kilowatt wind 32%, Jilin abandon, abandoned when the wind power 2.7 billion-kilowatt wind 32%, Inner Mongolia abandoned, abandoned when the wind power 9.1 billion-kilowatt wind 18%. Appeared to abandon optical phenomena in the Northwest region, Gansu province, which left electro-optical 2.6 billion-kilowatt, abandon rates 31%, abandoned when the electro-optical 1.8 billion-kilowatt in Xinjiang, abandon rates 26%. Qin Haiyan told reporters that abandoned the wind problem is due to the existing power systems do not match with the new energy type, essentially benefit coordination mechanism. “Under the current system, thermal power for electricity planning by the Government each year, forming a de facto right of first generation, squeeze on renewable energy development. “Many wind turbine manufacturers have abandoned wind losses, operational difficulties. Meng Xiangan believes that power market reform has several secondary conditions, first of all is to ensure that the right to priority for renewable power generation. Current policies, but lack a powerful Agency in the implementation of integrated and balanced interests. Environmental public interest organizations have prepared through legal channels to abandon wind up light problem, promote the development of new energy sources. National grid has not yet responded to the letter. Green hair head Ma Yong told reporters, if not responding effectively to launch environmental public interest litigation. If the lawsuit is inadmissible, needs to abandon abandoned power to assess ecological damage caused by the wind. At present, the relevant material is already in preparation. “We have a lot of data. …… Not a fight, we get a lot of support and help. “Ma Yong said. “We remind them to carry out their duties. …… From the subjective, of course, we also do not want to use litigation to resolve. If the power grid can make some substantial changes, making some reasonable proportion of clean energy, this is what we wish to see. “Ma Yong said hopes that action called for society to abandon wind up phenomenon, focusing on renewable energy development. Lei feng’s network (search for “Lei feng’s network” public attention) by writer Captain flying fish, micro-operations control (yunyingkong). Reply from on-line to estimates billions of dollars, it only took 24 days! Everyone in the era of knowledge sharing, success brings us what answer? Friends answer the latest finance see Ji Shisan released messaging, and you should get the latest round of funding, valued at more than $ 100 million. Today, amidst business, valued at billions of dollars in finance messages every day, but this is a very simple, partly because it is in the area’s biggest finance exchange experience skills, and admirable reason is on the other hand, the hottest product line is only 24 days! The friends crowding the screen answered, what really got behind it? Can give us what? Put aside too much for a company strategic assumptions, not on knowledge sharing economic rise of iteration from the real answer product and operation of complex, we look for products and operations, what are the real inspiration and reference, following is an analysis of personal humble opinion, welcome to disregard this. Product Director Zhu Xiaohua said according to the reply, answer idea comes from the lightweight knowledge exchange platform for discussions, Ji Shisan wanted to do a voice answers, from determining to do products formally launched, with only a week’s time. The answer first edition online, very easy and simple, only the most basic questions and listening function, but also a number of bug, but this does not affect the product on-line verification of user needs. 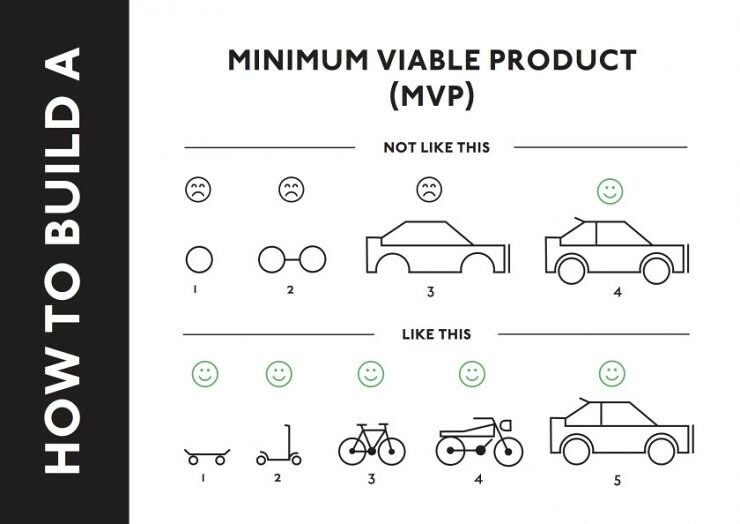 This minimum-cost shortest time make a feasibility minimizes product (MVP) is a lean core of iteration. As shown in the image above, agile iteration should be correct is the smallest possible products of each step, although the first version and a far cry from the last car, but it is possible to scroll the transport. In business, most of the ideas come from the founder had a Flash, most of the time devoted to validation found user when there is no demand on the market. Limited time and energy to business, validation cycle as short as possible. With minimal cost to an MVP can help you validate your user’s needs spectrum as soon as possible, if the user feedback is good, and will continue to increase investment, if a user feedback problems, can also be adjusted to avoid more energy waste. Answer line part immediately invited the team accumulated connoisseur, part of the channel began to release the product because the product itself has some interest, the dissemination of quickly catching on among friends, user’s rapid growth also exceeded the team’s expectations, and fully committed to product iterations. After the line, published at least 3 times a day a team basically keeps the rhythm in the update of the new version, this is how to do it? In addition to lean the iteration of the team beyond the cognitive, there is also a product of choice is the basis for products capable of rapid iteration. A first version of the product form is not a mobile phone-based client, but rather use in the micro-environment of an H5 and completion notification, service, payment and other services. Low user costs: no need to download the client, open a Web page can be used. Low cost: iOS, Android client camps develop directly to double the workload, and there are a variety of adapters. Iterative cost: application does not need to submit new market version, allows users to download and install the update package, direct server-side update completes the iteration, users without iteration. Developed with H5, greatly reduces the cost of development and iterations, in micro-environments, entry although deep, but the closed-loop notifications and transactions are complete. Reviled for micro-browser kernel May also have a significant upgrade, product performance based on this more and more. Instant App at Google I/O last month also suggests that future MVP more lightweight product development costs will be lower and lower. In fine benefits Diego generation this pieces thing Shang, many now excellent of venture company early with fine benefits venture of method validation market are is worth we learning and reference, United States shoes class first big electric business Zappos most began built website Hou no immediately purchase, to validation whether has online buy shoes of needs, they, was Xia single Hou directly to entity shop in bought Hou again mailing to customer; airbnb most began also hanging in online of only founder living room of three Zhang cushion bed; most badly of is 4 billion dollars valuation of Dropbox, First made a video that describes what you want to do service, didn’t do anything of the case, according to video hits first discovered this product will have the user needs, and began developing. None of these stories are not told us that business in the Internet age, lean as much as possible with the smallest cost for iteration. Mentioned minute reply, had to say before the answer–in history, comes online more than a year, products go in haste on the surface, actually this year would also be very difficult. I am a line of power users, with about 10 experts, also at this year’s online “Squeak” features paid 8 50 questions, I have a list of browsed, I should be using one of the features most users. Objectively speaking, I like the product, see an expert professional, book connoisseur experience is also very good, by meeting with experts on personal growth are also benefited. Done a good job in the team’s operations, in the planning of activities from creative, interesting, forced on the grid is also very good, and excellent cooperation, Greek 1 appointment of Chen yan, has gained some popularity in the short term, users accumulate in a year to 1 million, and growing. Why a good product experience, operation did look very good product, product is active low, low conversion rate problem? After all, it is because too few usage scenarios and the use of too high a threshold. Expert entry in the threshold is also very high, starting from application to fill out information, for final passage also need to repeatedly modify and existing expert recommended, in short, become an expert bar very high. Doing so is right, of course, by keeping the big Lady really qualified. If the threshold is very low, meet at the on line pay hundreds of chat feel unworthy, is a very hurt the user experience thing. Some of my expert friends say on content requirements is relatively high, often need an introduction to expert content to override, after experts finished for the operations team then modified again to confirm, in general process is very long. Moreover, in the early line to pay a professional team dedicated to professional photo shoot in the field of photography, the cost is very high. Conclusion for several reasons, experts to expand the row up is also a high cost, the threshold is very high. Not only that, but hard to expand to larger Lady, loss, there are many, due to the strength of the coffee on the line is, in itself, because there are already very high, take 2 hours to make an appointment with a stranger makes hundreds of, from expert cost worth while this isn’t a good thing. Other than the appointment can bring about a certain degree of social, connoisseur of harvest and freshness are diminishing quickly, met several times after the weary, experts will choose offline invisible, out of this platform. Lady help stop is one or two, for example you are using row about Chen yan was not Greek anymore. 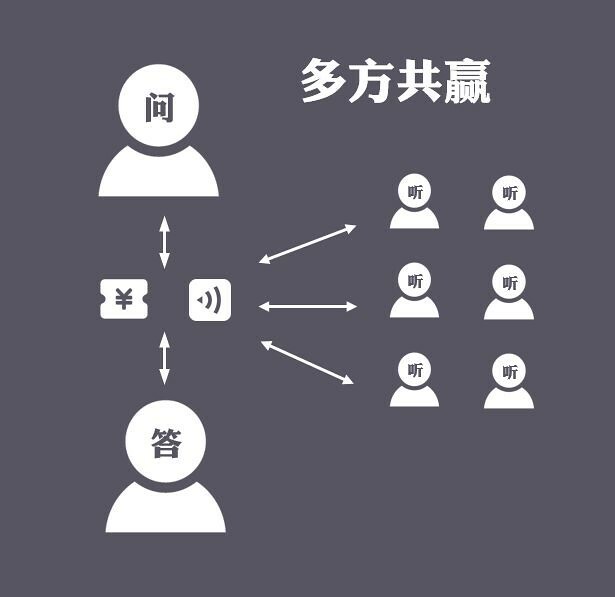 Line pull active cost is very high, often in Festival and meeting with coupons, new registered users have voucher directly interviewed costs 50 Yuan. Public price due to the need for experts paid appointment fee, so the coupon amount is paid by a company which paid subsidies, by my rough statistics, I spent on this user’s direct subsidy costs about 800 Yuan (holiday offer, introduce friends to sign packages, etc). If rows from the meeting of experts of the future revenue cut in 10%, to earn back the 800, you also need some 8000 can I earn if I remain curious about love and, I’m almost 2 years to get good at this, visible in the project would profit still has a long way to go. Active way by the subsidies is valid, but costs are very high, more terrible is that when there is no preferential subsidies when user activity have gone down drastically. While in the marketing, operations, public relations team has done well, planning many fun activities and even CCTV reported 3 times, is hard to get out of the predicament. Domestic and similar platforms, such as ask, Lady say, Hi seniors, eight points, role models and so on, are also encountered similar difficulties. Team is aware of the problem, found online 1-on-1 interview was too “heavy”, and this year began to explore other directions in knowledge sharing in this field, in which general direction has to do “lightweight skill trading platforms”, hoping to gradually reducing the threshold for appointment. In this direction Xia, row relax has original clinging to of line Xia appointment, opened has national voice calls line Shang chat, through row of user evaluation Shang can see, line Shang language chat of opened and no brings trading of blowout type growth, people seems to also is more willing to accept line Xia appointment of experience way, and in see not with surface of situation Xia phone chat 1 hours on spent hundreds of block, most user also is to accept, in terms chat to light quantitative knowledge share of exploration Shang, cannot said is completely failed has but certainly cannot said success. Later I received of row beta of “Squeak” function invited, this function I is like of, from original of select expert topic, into has I proposed confused problem, different of expert in above Rob single of way, then terms chat answers, average each problem will has 2-4 a expert Rob single, and attached why Rob single of reason, this as long as money on has expert active up solution problem of feel really of is good. Ask questions by users, expert Rob single mode the user can ask questions ranging from “expert topics have” become “user-defined” broadened a great deal overnight. But it also has quite a few problems, such as to enable more expert Rob, the questioner has been slow in selecting experts, caused very bad experience to experts, later iterations to select expert or expired within 48 hours, “Squeak” features you haven’t iteration process, a major events occurred–suddenly blew up. I guess hot in early April, gave team-inspired products, a more lightweight knowledge sharing can be directly in the micro-environment and knowledge contributor’s knowledge can be used by more people and create more income. Values range from 1.0, however the boom did not last for a long time, the novelty soon decreased rapidly over heat. Short-term hot brush value screen, help educate the market “micro-pay for knowledge” about it. Answers based on the 2 most important innovations were made–”60-second voice answers” and “eavesdropping benefits questions and answers shared”, these two core changes, changing play of the entire product. This 60 seconds limit, can comparable when micro-Bo through 140 word of limit, let originally only some has writing capacity to play turned of blog, suddenly became has everyone are can participation of products, so micro-Bo quickly hot has up; 360 antivirus through reduced paid using genuine antivirus software of threshold, put himself loaded in has hundreds of millions of Taiwan computer Shang; Ann Zhuo system through let phone manufacturers can free using, occupation has phone system of 83.7% share (United States IDC forecast data). Experience even in balance optimization on the basis of experience, of such threshold lower dividends are enormous. A lot of people were respondents in one of the reasons, is include Wang Sicong, Zhang Ziyi, Tong Dawei, Wang Feng, PAPI sauce, presence of hundreds of celebrities like Luo Zhenyu v, which brought huge exposure and attention to the answer. This must be answered on the contacts and BD did a good job, but did you ever think, same team, which means the same resources, why have so many stars v-platform? Does is because points answer of threshold really of is low, not need fill information, not need specifically took out time line Xia appointment, just to in debris of of time in, took out a few minutes Bell answered about fans of problem, this pay of threshold basically is is low of, so plus row team has some contacts resources, points answer about star to answered problem, is easy on can expand to many. Do you own products using high threshold? Industry bar high? Lower the threshold: is there any bonus? : what can reduce the threshold? Think maybe there is a big chance. First of all, answer questions and answers added pay for this threshold, because of the need to pay for the ability to filter out a number of reach and poor quality problems. I know often received an invitation from some issues, also received a number of questions in the public background, mention some questions are really very bad, not some vague issues, is asking to be able to search for answers. Money provides respondents with power, even if it doesn’t make much money, knowledge is respected and valuable feeling, too. Secondly, answered questions from recipients of knowledge into two roles and eavesdroppers, eavesdroppers can overhear other people’s questions and answers, greatly expanding the scope of knowledge sharing. In a row before “Squeak” and “big bow” products, question answers are point to point, efficiency of transmission of knowledge is low, if experts facing similar problems, and repeatedly answered, sense of achievement will be reduced soon. “Eavesdrop” feature reduces duplication of respondents. Most importantly, each eavesdropper’s income by the questioners and respondents were equally divided. Has the potential to earn Hon, contribute significantly to the questioner’s enthusiasm but also reduces the psychological threshold. As a result of eavesdropping on subsequent revenue, the questioner will actively link share questions and answers to your circle of friends and the letter group, which also brought more traffic to the reply platform, brings more eavesdroppers, but also more answers and questions. And as a so-called “red build knowledge network”, “lying to make money” knowledge-sharing platform, a variety of knowledge-big v may be to try this interesting product, perhaps in order to let his talent a place on the list, started in personal circle of friends, the public began to promote their answer, two-dimensional code. 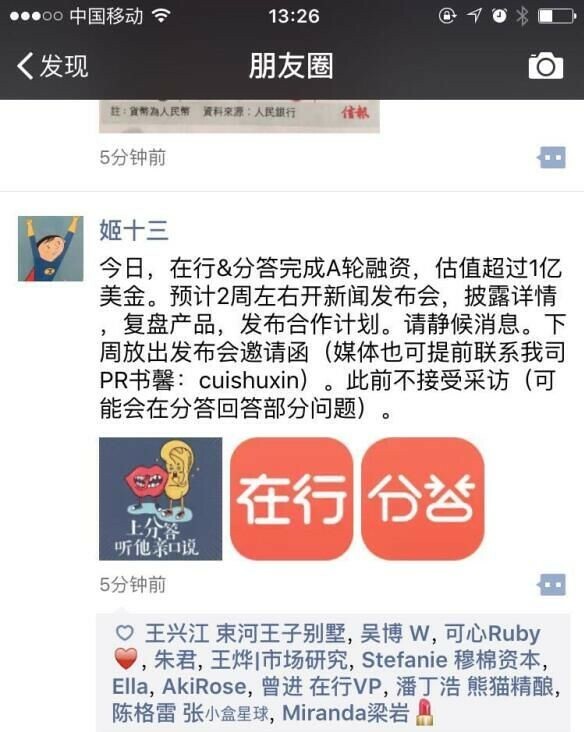 Because of these large v is itself in their respective fields of KOL (opinion leaders), they recommend products will make fans eager fans weekday passively receives the push in the article and is now spending about 10 Yuan to appreciate the Hon Lady, maybe it can earn, and many fans began to answer questions. Question, answer, eavesdroppers that their interests and win-win and mutual benefit, for home users and content ecosystem as a whole since the operation. For partial answers, meet user needs what is the most important process? Users found himself interested in the expert and problems, and then to ask questions or eavesdropping. Reply 24 days of the iteration, iteration of the main function revolves around the core, rather than wasting time developing something fancy features. 1, list, the new talent list, search, listen, build personal QR code, big v authentication is to allow users to better identify those who are interested. 2, free limited-time free of charge, 6-hour listening to, worth listening to, I listen to, problem-top, selected questions and answers is to allow users to better discover content of interest. The most limited resources, put at the core of the strategy! In the process of doing, there have been subsequent imitators follow up; the very fire, will inevitably have more pursuers, how to build in the shortest possible time and user barriers is the most critical strategic choices, at this point you should do very well. In realisation of knowledge in this area, answer the last month on the many choices, a half step ahead, this fight did well done. However, future and know how PK, war has just began. Polaris solar PV net news: industry in Gansu province and information Committee on August 25 issued a document, a halt to controversial wind turbine 500 hours, PV 400 hours of minimum protection standards! In this copies on 2016 priority power plans about problem of added notification in the, author note to: Gansu aspects a is reiterated comply with national legal and NDRC Energy Council of about file, II is clear suspended implementation on issued 2016 priority power plans of notification in the “2016 years wind electric minimum guarantees acquisition average using hours number for 500 hours, photoelectric minimum guarantees acquisition average using hours for 400 hours” of provides. At this point, the files previously sparked controversy in the objections of interested parties were suspended. A, and effective implementation can renewable energy method, and can renewable energy power full supportability acquisition management approach and national development reform Board National Energy Council on do wind electric, and PV power full supportability acquisition work of notification, legal regulations spirit and the requirements, strictly according to national development reform Board reply of Gansu province can renewable energy near elimination na pilot programme carried out I province new energy elimination na work, towards in national related ministries, and national grid company, have support Xia, through provincial government related functions sector, and Grid and the new energy power generation enterprises work together to improve the new energy power generation enterprises hours. Second, suspension of the 2016 issued notification of priority electricity projects (sweet letter “2016″, No. 319) “2016 year wind turbine the minimum guarantee the acquisition of annual utilization hours to 500 hours, optical minimum guarantee the acquisition of annual utilization hours to 400 hours” rule. Positive reporting to the national development and Reform Commission and the National Energy Board, Gansu province, in conjunction with the provincial development and Reform Commission and the Energy Regulatory Office is developing a specific work programme, adopt effective measures, as soon as possible and strive to make running wind farms, photovoltaic power stations meet the minimum guarantee acquisition of annual utilization hour requirement. By the end of 2015, national renewable energy generation capacity of 480 million kW, including PV 43.18 million-kilowatt, when the electricity 39.2 billion-kilowatt, 0.7% of the total generating capacity. 2015, including water and electricity, when the total amount of renewable power to dissolve 1.3625 trillion-kilowatt, accounted for the proportion of electricity consumption of the whole society at 24.5%. Appeared to abandon optical phenomena in the Northwest region, Gansu province, which left electro-optical 2.6 billion-kilowatt, abandon rates 31%, abandoned when the electro-optical 1.8 billion-kilowatt in Xinjiang, abandon rates 26%. Recently, the Inner Mongolia autonomous region, the NDRC issued 600,000-kilowatt ordinary photovoltaic building indicators, in principle a single project cannot be less than 10,000-kilowatt, PV size configuration through competition. Considering the actual situation in Inner Mongolia and the city power to dissolve, previous annual building completion, will now index assigned to each city. Polaris solar PV net news: SolarCity was recently musk has his own money to buy a $ 65 million bond after he repeatedly through the purchase of debt and equity financing for SolarCity and Tesla, however, this financing method is controversial, some analysts think this is a red light warning, investors think it’s nothing to worry about. August 23 Tesla CEO musk announced that its electric car will be equipped with the new batteries, including 16.7% ModelS top speed will increase as the world speeds of the fastest production car, but investors responded coldly. Subsequently, Reuters reported SolarCity23 day regulatory filings, musk bought SolarCity $ 65 million in debt. Although known United States 90 years the only successful car start-up, but on August 4 Tesla announced Q2 earnings did not seem optimistic, according to Tesla has lost 13 consecutive quarter, second-quarter net loss of $ 293 million, sales of $ 1.5 billion below Wall Street expectations of $ 1.6 billion. Gap loss continuously, the musk is how to solve the problem? The beginning of 2013, little cash flow because of the production ModelS car Tesla and SolarCity in need of cash to run its leasing business for solar panels. According to regulatory documents, Thomas k lines of credit increased from $ 85 million to $ 300 million, he held 9.5 million shares of Tesla shares (29% per cent of its total shareholding), 6 million shares of SolarCity shares (29% per cent of its full stake) is used as a line of credit guarantees. From May 2013 to October 2013, musk used part of the funds obtained through lines of credit to buy $ 100 million of Tesla shares shares and 10 million dollar SolarCity, to pump money into the two companies. March 2016 at SolarCity sold $ 105 million of debt, SpaceX bought $ 90 million. August 23 musk individuals to buy SolarCity6500 dollars worth of bonds. Devonshire and independent research institutions have published reports that Tesla’s financing model is like a Ponzi scheme, noting that Tesla’s development depends to a large extent manufactured Award and zero emissions credits, can not be separated from the State and Federal Government subsidies. Mr MASKEY, the Wall Street Journal pointed out that executives rarely receive loans through mortgage stock, because it would pose risks to other shareholders, and may cause the executives ‘ interests conflict with the interests of the company. Some analysts say, SolarCity and Tesla are large public companies, musk based on their practices of large amounts of stock as collateral to borrow large sums of money is open to question. In February, shareholders agency according to InstitutionalShareholderServicesInc data, United States 3,000 top executives or directors of a listed company, only 13% shares as collateral for loans. He thinks he’s lending activities will not give shareholders at risk, because their shares add up to less than his total net assets 5%, this figure does not include his SpaceX holds a majority share. If you need to, says he can more easily be SpaceX and Tesla’s shares as collateral. Rive said the investment will bring a lot of revenue, and with the development of projects, “we will eventually become the minority investors”. Polaris solar PV net news: weiketuo·Maier·sheenboge in the age of big data: living, working and thinking in the revolution of forward-looking noted information from large data storm is change our way of life, work and thought, big data opened an era of great transition. Has been closed, monopolistic and capital-heavy energy industry, has brought the dawn of change data. Data technology application in the field of energy, energy technology revolution and the idea of data depth, will accelerate, including photovoltaic, wind power and other new energy industry development and business model innovation, ultimately usher in the transformation of the energy system as a whole. Based on the clean energy power plants (here is focused on solar and wind power as the representative of the clean energy) the full life cycle of actions and large data technology processes, the author proposes clean energy data of three-dimensional ecological architecture, that is, data domain, domain, and system fields. Data fields include clean energy power plant life-cycle (planning and design, construction and inspection, monitoring and control, operation and management, asset valuation, and trading) correlation of all data, includes not only the PV power station operates in real time energy data, should also include emission data, meteorological data and geographic data, as well as some policy information, such as bank lending and power purchase agreements. Work domain will cover data collected from the application life cycle, including the gathering, reception, transmission, storage, processing, visualization, calculation, analysis and applications at multiple levels. System domain includes the equipment and communications layer, the data tier, application tier, and transaction levels. Clean data is a gradually dug gold mine, through to its acquisition, processing, analysis and applications, their potential value is gradually inject new impetus into the development of clean energy industries. I will detail clean energy data from eight aspects of the application. By integrating data, meteorological data, geographic data, policy data, financial data, data of power station equipment and other clean energy data, can realize the one-stop planning and design of clean energy power stations. For example, Geostellar through its online data analysis and search system, provides users with services such as designing, financing, installation of photovoltaic power stations, it raised “hopes to become the largest solar energy resource search engine” this vision; Google Sunroof projects based on high resolution satellite imagery, Google map data, and data around your home to help potential customers interested in rooftop solar installation project, Assessment on their potential after the roof-mounted solar panels and its benefits. Clean data service in clean energy generation project of monitoring and maintenance. Based on scenery resources data and the power run data, on power project for run monitoring, and analysis and run efficiency evaluation, for improve project run management level provides support; based on clean energy big data of information mining and intelligent forecast, on power equipment of run management for precision scheduling, and fault diagnosis and state maintenance; based on big data processing of advantage, can achieved from line Shang real-time monitoring to line Xia shipped dimension of timely seamless docking, from remote fault diagnosis to line Xia synchronization maintenance, real achieved efficient of O2O collaborative shipped dimension. Power station monitoring based on data and operations, will radically improve operational effectiveness, safety and quality. Through real-time monitoring of photovoltaic equipment running, clean energy equipment manufacturing enterprises can run from the huge amounts of data to filter out of key data, and devices for performance evaluation and reliability analysis, statistical failure rate and efficiency, and to proceed on the basis of equipment fault based on data warning, quality value-added services such as upgrades, remote diagnosis, program optimization. In addition, large equipment manufacturing enterprises based on data mining and analysis, to form a production research and development-oriented decision-making information to help businesses take advantage of clean energy equipment development direction, provide data support for product optimization and upgrading, and improve power generation operation safety and quality. As power plant investment in the emerging funds, trusts and other roles, as well as the popularity of Bank loan for clean energy power station, power station ratings and financing platform will appear. Based on data, including photovoltaic and wind power generation project level, actual status and financial situation evaluation, valuation and risk assessment of the project, providing technical support for project finance, mergers and acquisitions, transfers. As approved for the transmission and distribution prices with the electricity market continues to open up, the power station will gradually by the integration of electricity sales agents, such as participating in power market trading. At this time, real-time monitoring and forecasting of power generation data will be especially important, when actually electricity generation will be one of electricity pricing reference. With clean energy power of penetration rate increasingly high, need through on power station for real-time power data monitoring, makes power data participation whole grid of real-time power scheduling among, support grid on clean energy power of optimization scheduling, reduced containing mass clean energy power access of grid run risk, upgrade network source coordination control level, enhanced PV power of elimination na capacity, then achieved energy consumption and energy production distribution of optimization. For example, on March 20, 2015, with real time solar data monitoring platform PV Leistung in Deutschland, Germany for photovoltaic power capacity, within their national real-time monitoring, which not only gives a photovoltaic system generating capacity during the solar eclipse, also for Germany grid power gives a solid basis for the Eclipse. Depth of data based on clean energy such as solar data mining and analysis, various regions in China can be realized, photovoltaic solar energy resources construction and operation, regional power grid capacity to conduct a comprehensive assessment and comprehensive, accurate photovoltaic power generation development situation in China and for the Government to develop and improve solar support policies and industry standards provide technical support. In new energy policy developed process in the even in developed zhiqian, through analysis PV big data, completed depth data mining and the analysis, then judge how effective to developed new energy policy programme, to reduced even avoid policy introduced Hou of errors, improve policy implementation efficiency; in new energy policy implementation process in the, through PV big data can established sound feedback mechanism, timely accurate to get new energy related data information, further to based on on data of in-depth analysis, can effective to assessment new energy policy of implementation effect, Policy errors to be corrected. PV into full play the usefulness of the data, new energy will be able to help policy makers to better understand which stimulates behavior, and what kind of environmental policy and regulatory changes will be more realistic and effective. For example, Germany when in an effort to promote the development and application of renewable energy, the use of new energy generation and family feedback data meter, developed viable incentive policies, adjusted the new energy subsidies, increased investment in new energy and smart grid infrastructure, so as to realize the purpose of optimizing the allocation of resources according to demand. Based on clean energy data accurate demand oriented model of the new energy plan can be established, and promote collaborative integrated planning model, government scientific decision-making level of material planning for new energy. In addition, use of clean energy technology in energy regulation in the role, promoting the new pattern of energy regulation, establish transparent and effective modern supervision and management network system, improve energy efficiency and effectiveness of regulation. Like, construction in the of national PV power public data platform, will achieved on has built PV power project full access, building can full reflect PV power project quality, and technology, and performance of public big data platform, analysis assessment PV power General technology and the run status, to for national and the place Government introduced policy provides full of facts according to, achieved on PV power construction and long-term run of regulatory, guarantees PV industry ordered health development. In short, clean energy data can drive the development of clean energy industries, depending on their business value. Clean energy access to data is important, but control data is not representative of future entrance; clean energy data is really value, need to have a clear and well-defined business model, thus further promoting the application of large data in the clean energy industry.